Prepared in just 10 minutes, allow 3½ hours for this slow cooked dish to become tender and flavoursome. Preheat the oven to 170c, gas mark 3. Cut the steak into 4cm chunks. Put the flour and 1 tbsp paprika in a bowl; season and stir to combine. Add the steak, toss to coat and transfer to a casserole. Add the onions, garlic, chilli, tomato purée, red wine vinegar, stock, tomatoes, bay leaves, lemon peel and 2 tbsp paprika. Mix; add a little water. Cover and cook for 3 hours 30 minutes. Heat the oil and butter in a pan; cook the mushrooms for 5 minutes. Add to the goulash; scatter with parsley. 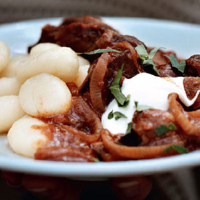 Spoon over the soured cream and serve with gnocchi.